Dans les dépendances de pinba-mysql-engine, mysql-server-5.1.54-0.dotdeb.1 est requis, mais il n’est pas présent lors d’un apt-get, alors que sur le dépot, il date du 17/12. This is a great tool! Thank you. The problem is that there are no graphical tools to display Pinba statistics, you must write your own scripts using RRDTool, There are some examples at pinba.org. Any chance on mysql-server-5.5 support? @Michael Lednev : as soon as I fix some minor bugs in the MySQL 5.5 packaging script. The MySQL 5.1 support will be dropped then. Any chance this will end up in the ubuntu repositories? 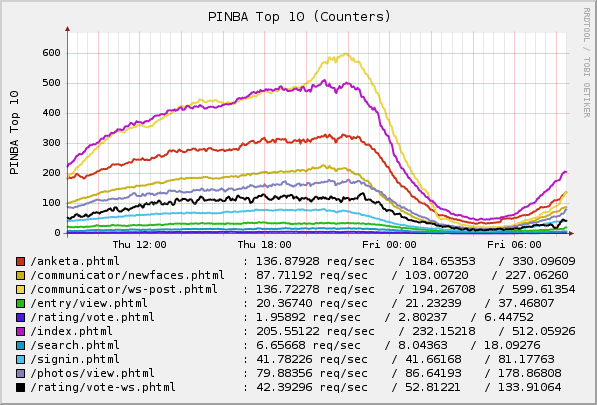 it also looks like a good solution but not sure what the pros and cons using statd vs Pinba? @ForLoop : statsd is a very powerful tool to gather metrics, but Pinba has a lot of built-in features / algorithms that leads to out-of-the-box useful results. It’s up to you to use the tool that fits your needs.